→What’s the Best Guitar Slide? 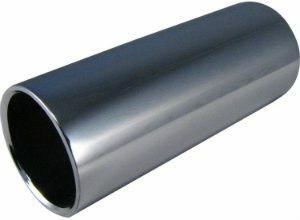 Why do I need a guitar slide? Well, that’s a good question, and the truth is, depending on your style and genre preferences, you may not even need it. However, if you look up to the greats like Duane Allman, Derek Trucks, Ry Cooder, Robert Johnson, Mississippi Fred Mcdowell, Son House, Elmore James, Blind Willie Johnson, Bukka White, Lowell George, Roy Harper, Bob Brozman, Jerry Douglas, Warren Haynes, Pt. Vishwamohan Bhatt, Robert Randolph, Eric Sardinas, Sonny Landreth, Debashish Bhattacharya or a myriad of other Masters of Blues, chances are you’ll want one. Slide guitar players favor this technique because it allows them to vary the vibrating length, and pitch, of a string or strings in a manner that creates smooth transitions. They come in a few different flavors – as slides (what we usually imply), tonebars (for pedal steel players), and rings, though, to be honest, you can even use a knife or a fork for the task, or a Coricidin medicinal bottle, as old master slide guitar players were wont to do. However, to prevent you from resorting to such drastic measures, here are some popular choices, classified according to material and manufacturer. 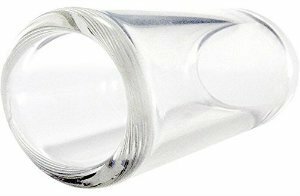 Treat yourself to a nice glass guitar slide ring that will help you elicit that warm, thick tone with accentuated middles. The Dunlop 210 is processed from high-quality boron silicate, heat treated and annealed to give you a flawless tube and perfect fit. The medium with medium thickness walls fits ring size eleven. You’ll be wearing it more than your wedding ring. Don’t hesitate, check out the Dunlop 210 today! Having trouble getting that clear and polished tonal voice from your guitar? Don’t fret about it. The Ernie Ball glass slide is here to help you! The slide is made of high-quality boron silicate, 8mm thick and smooth as silk. It comes in three different sizes, with medium fitting ring size 8. If you’re looking for the perfect slide for acoustic blues, look no further than Ernie Ball Glass slide. Influenced by Duane Allman and Elmore James, Derek Trucks took slide guitar to a whole new level. Trucks has done a great deal for popularising Indian music in the West, always accompanied by his trusted medicine bottle slide whose design has been replicated to produce the Derek Trucks Signature Blues Bottle slide. The Dunlop DT01 produces a sharp and crispy bite while delivering Derek’s fluid and vocal style of playing. 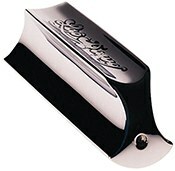 The Clayton Heavy Wall guitar slide gives you a smooth and clean sound, and has an image to match. It features see-through heavy wall, with the interior measuring 23.79mm. Translated into everyday English, this means the slide fits ring size 13, and it’s perfect for people with long fingers. Each Clayton slide comes with a protective case to protect your slide from damage, and a “Bottleneck Slide Technique” instruction sheet. Ever since the days of Robert Johnson and the birth of blues and rock’n’roll, the masters of blues have used the medicine bottle as a guitar slide. The Dunlop 273 Blues Bottle slide honors the age old tradition and replicates the design, making this slide ideal for acoustic blues. This puppy will send you back to the Mississippi Delta with its warm, smooth and seamless sound. It ain’t Coricidin, though. 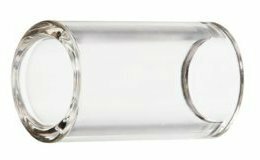 The Planet Waves Glass slide comes as a treat for all those who love warm and thick tones with lots of sustain. The slide is extra durable thanks to the high-quality boron silicate and immaculate finish. It’s available in three sizes, so you can choose depending on your playing preferences. The slide lends itself particularly well to players who prefer knuckle length slides for their index, middle or ring finger. The Dunlop 220 Chromed Steel slide goes well with electric guitars, yielding an exceedingly bright tone, with enough bite to grit your teeth. It will give you flashes from the past of steel lap guitars with its twangy, sweet sound. The slide’s made of chromed steel, with medium thick walls, and fits people with slender fingers. When not using it, stick it in the guitar slide holder and practice scales. 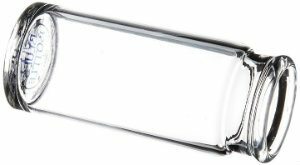 The Ernie Ball Chrome plated brass pinky slide is exactly what it says on the tin – a brass slide with chrome plating and machine-brushed edges. It’s been buffed to perfection to give you a smooth pitch transition. The slide allows you to throw in some riffs with your pinky while leaving your other fingers to play chords. The slide works great for both players on the acoustic and electric guitar. 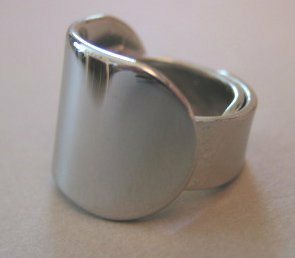 As much as a piece of jewelry as it is an indispensable piece of musical equipment, the Will Ray Stealth Ring slide for Guitar will make your blues, jazz or garage rock sound all the better. The ring’s chrome plated for that smooth, satisfying feel. It came to being as a brainchild of Will Ray of the Hellecasters. To see what it can do, listen to some of their stuff. 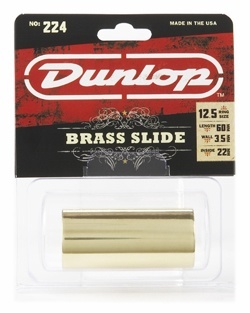 The Dunlop 222 Brass slide will be your favorite metal slide once you get a hold of it. Its authoritative mass allows you to coach that warm and resonant tone out of your strings without applying too much pressure. The slide is ideal for metalheads with long fingers, helping you to reach across all the strings. If you are that type of player, fret not! The Dunlop 222 is here! If you like the sound of brass, this is the ideal thing for you. The Dunlop 224 is made of brass to give you that recognizable warm and resonant sound. The slide will help you to apply just the right amount of pressure to the string without pressing down, thus giving you better control. It lends itself perfectly to acoustic guitars, coaxing thunderous volume out of those little, unassuming babies. 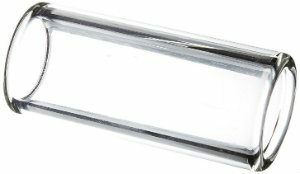 The Dunlop 926 Lap Dawg Chromed Brass Tonebar is designed and produced with Lap Steel and Dobro players in mind, wishing to give them more accurate, economical and agile way to cajole great sounds out of their instruments. The Lap Dawg has a larger radius to allow you more sustain and better vibrato than a standard tonebar, with its angled sides giving more control over fast runs, pull-offs and hammer-ons. An authentic replica of Eric Sardinas’ personal handmade piece, the Dunlop 284 Eric Sardinas’ Preachin’ Pipe delivers the fluid feel of the bluesman’s own style. The slide is of pure brass and features a tapered shape and perfectly worn walls to give you that singular resonance and sensitivity. The curve is a great feature as it allows you to cover all six strings for chord slides without pressing too hard. 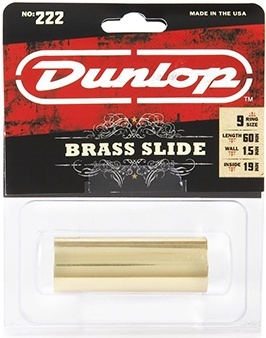 The Dunlop Dunlop 227 Concave Brass Guitar Slide features a slight curve which allows you to apply just the right amount of pressure to the string without pressing down, giving you better control. If you like the sound of brass, then this is the perfect thing for you. It delivers clean and warm tones. It may feel a bit on the heavy side in the beginning, but practice makes perfect. The Peaceland Guitar Ring gives you the ability to fret chords and notes, all the while doing the original job – giving a measure of smoothness to your pitch transitions. The slide works best in conjunction with other Peaceland Rings on other fingers to achieve a variety of harmonic combinations. This way you’ll have an added measure of flexibility that regular slides just couldn’t provide. Don’t miss out on this opportunity! If you want to get that traditional blues sound without shelling out for a resonator guitar, the Dunlop 243 Moonshine Ceramic Guitar Slide will make wonders with your acoustic guitar. It delivers a rich, full-bodied and quite resonant sound, with well-defined highs and mellow, tender mids. The exterior is individually hand-formed for added resilience, while the interior features porous surface to absorb “finger moisture”, aka sweat, so it prevents slipping. The very minute you hear “Fender”, you know you’re getting some quality stuff. The Fender Steel Slide is no exception, as it meets Fender’s high standards of craftsmanship. The tone that this slide delivers is bright and crisp, with sweet highs and ringing sustain, and a bit more shimmering than that of a glass slide. It really comes into its own on slender fingers, so be sure to size it. The Shubb SP1 Pearse Guitar Steel Bar is the brainchild of the great late John Pearse. It is designed to provide players with improved control and smooth movement. The cutaway ends and a semi-bullet tip enable these, respectively. Note that Shub-Pearse steels are machined rather than extruded, giving the playing surface true radius. The extra length makes the Shubb SP1 a favorite among 8-string lap steel players and Hawaiian guitarists. The Dunlop 920 Stainless Steel Tonebar was specifically designed for Jerry Bird and his style of playing. This means it’s suitable for pedal steel, Dobro and Hawaiian style guitars. The tonebar is made of high-quality stainless steel and available in four sizes. To say it’s on the heavy side would be an understatement, but once you master the extra weight, you’ll know where the extra steel went. So, order up! The Dunlop 256 Joe Perry "Boneyard" Slide was designed with the help of the legendary Joe Perry of Aerosmith. The slide is made of porcelain to give you those soulful and bluesy tones for both acoustic and electric guitars. Moreover, the interior is quite porous to absorb finger moisture. It’s available in four sizes depending on your playing preferences. A word of warning – before actually buying a slide, size it! So, there you have it – a near exhaustive list of best guitar slides, reviewed and classified by material and manufacturer. Some of the best slide guitarists seemed to favor slides of their own making, and luckily, many of their designs have been successfully replicated and found their place on our list. However, you should know that in the end, it’s not the slide that plays it, it’s not the pick, nor the amps, pedals or guitars itself – it’s you. Case in point – bottleneck slides. In the end, it really comes down to you and your choices, and we hope this list helped you make some.